Deadly, and cytotoxic venom which destroys all tissue – even bone. This lovely 1 meter long Malayan Pit Viper was submitted by a reader of Thailand Snakes (.com), John Helm in Jomtien Beach, near Pattaya, Thailand. The photo was taken on 3/7/11. John moved the snake from his patio over a wall separating his house from some heavy bush. These snakes appear to be lazy, or not aggressive – and John said this as well. However, they are violent strikers and can hit you from further than you think. In addition to that, Malayan Pit Vipers can strike backwards VERY fast and VERY accurately. They need not strike out forward… In fact, I have a video of one striking a mouse I put in the cage on Youtube here. It struck backward. The other day I was observing one and dangling some paper behind it – it struck VERY fast and nailed it. 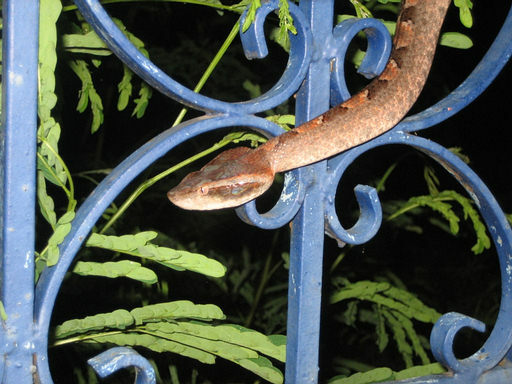 These snakes are reported to cause more deaths in Thailand than any other snake. The reason I presume, is because they bite village people who either rely on natural medicines – leaves rubbed on the wound, for instance – instead of getting to a hospital they can’t afford. These and the Russell’s Vipers are the most dangerous vipers in Thailand for bites. Of course, monocled cobras (Naja kaouthia), other cobras, and kraits are worse as far as their venom being deadlier. 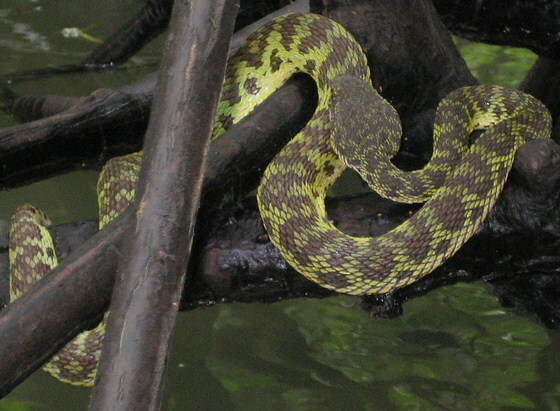 Mangrove Pit Viper (Trimeresurus purpureomaculatus) is Dangerous and Bites Frequently. Photo courtesy of Carlton Wagner and Michael Miller, used with permission. Also known as mangrove viper, shore pit viper, Gray’s pit viper, purple-spotted pit viper, and shore pit viper. In past (2004-2011) was called Cryptelytrops purpureomaculatus. Length: Males grow to about 60 cm and females to 90 cm on average. Habitat: Usually near water and very wet areas like mangroves along the ocean or brackish water. However, recently one was found on a sidewalk by a bungalow on the island of Koh Phi Phi in Krabi province, Thailand. They like stream banks with good cover – low lying plants that they can hide under. They also may like hilly habitat and have been found as high as 2,000 meters elevation in bamboo jungles. These snakes are found in high numbers on islands around Thailand. I have found this species in some abundance along the shore in mangroves in Krabi province. These Thailand pit vipers can have many color variations. They are usually like the photo above – greyish with a bit of purple in the coloring. Some are very purple. We’ve also seen a brownish toned mangrove pit viper with some yellow highlights. Now for our top photo we have a greenish toned viper. Obviously – color is highly variable in this species. Tom Charlton found black variations on Langkawi Island in Malaysia. Venom toxicity: Venomous and very toxic to humans. Though people have died as a result of bites from this snake, this is not usually the case. Symptoms – pain, severe swelling, bruising, blistering, and necrosis are more likely. Here (it isn’t live any longer) is a study of treating a bite by this snake with T. albolabris antivenom from the Queen Saovabha Memorial Institute with some success. Classified as – Trimeresurus purpureomaculatus by Gray in year 1832. Mangrove pit viper photo courtesy of, and full copyright by – Richard Richert. Thanks Richard! Tropidolaemus wagleri – Wagler’s Pit Viper – Dangerous and potentially deadly bites. Length: Average length of 60 cm. Male smaller than female. Female maximum length at 100 cm. Appearance: Wagler’s pit viper is a short green (งูเขียว) pit viper and the female is considerably thicker (3-4 times as thick) than the male. A marked difference in patterns is noted with the female becoming darker and with strong banding as you can see in the above image. The males are so radically different that they look like completely different species (sexual dimorphism). In three reptile identification books I have for Thailand, they make no mention of the differences between the sexes. The female is pictured in each case. Dorsal scale count ( 23 to 29 ) – ( 21 to 27 ) – ( 17 to 21 ) and usually 21 to 23 mid-body dorsal scale rows in males and 23 to 27 mid-body scale rows in females. Dorsal scales are strongly keeled in females, and lesser keeled in males. Coloration can vary significantly among females. Here is a very yellow T. wagleri. 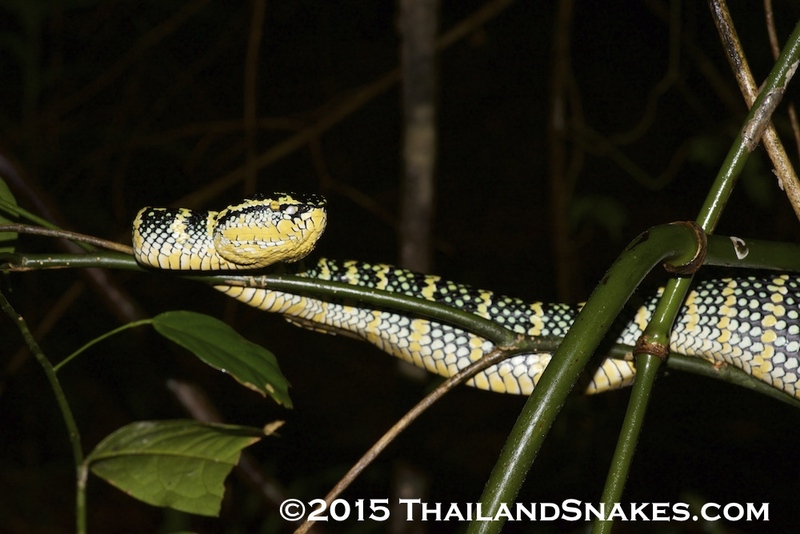 Yellow and black female Wagler’s Pit Viper from Southern Thailand. Here is a darker colored female, but not nearly as much as the top and bottom photos on this page. Not nearly as much lateral yellow as the previous photo. Gravid and ready to bear young. Soon to be the parent of dozens of hatchling vipers. Besides the difference in size, thickness, and pattern, the body type is also quite different. The male grows to be around 60 cm and is long and thin, more like a wolf snake or something similar. Below is a photo of a male Wagler’s pit viper found within one meter of a very gravid female. Obviously quite a big difference. Male Wagler’s Pit Viper – note the remarkable difference between male and female (Sexual dimorphism). Range: Southern Thailand south of Khao Sok National Park, Suratthani province. Other countries: West Malaysia; Indonesia; Philippines. There is a concentration of these common vipers on the island of Phuket, Thailand. Habitat: Elevations up to about 1,200 meters but most abundant at elevations from 400 up to about 600 meters in lowland primary forest, secondary forest and jungle – especially coastal mangrove. During the day these vipers can sometimes be found as little as a meter off the ground, up to a couple meters. They seem to prefer bushes over trees. Recently I found a gravid female at one meter off the forest floor and resting on a strong vine just 1 cm in diameter. Active Time? Mainly nocturnal, but occasionally found during the day, especially during or after rain. Crepuscular in nature, they are more often active during dusk and dawn, or on an unusually dark day during heavy rain. I have found these snakes during the day in a moderate rain at 400 meters elevation, and at 2000 hours after a light rain. Food: Birds – especially baby birds in the nest, mice and other rodents, lizards, frogs. Defensive Behavior: Coil back into s-shape before striking. Strike is typically less than .3 meters in distance. Mouth wide-open exposing very long fangs and white tissue. Can strike in succession rather quickly. Their strike is not very fast in comparison with some of the other vipers. The heat-sensing pits between the eyes can sense temperature difference as little as 0.003 degrees Celsius. If continuously threatened they may hold their mouth wide open, like the photo above. 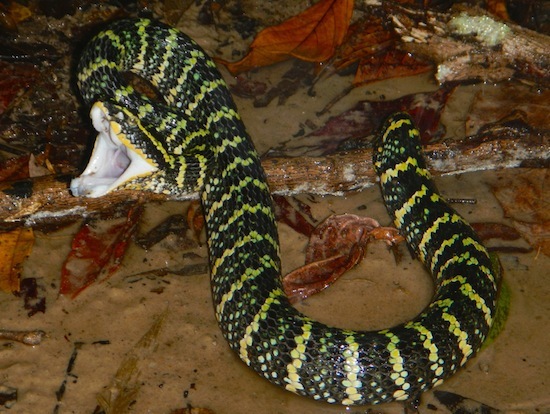 Venom Toxicity: Potentially deadly. Strong venom that usually does not result in death to humans. Victims experience a strong burning sensation upon envenomation, and swelling, necrosis of tissue. 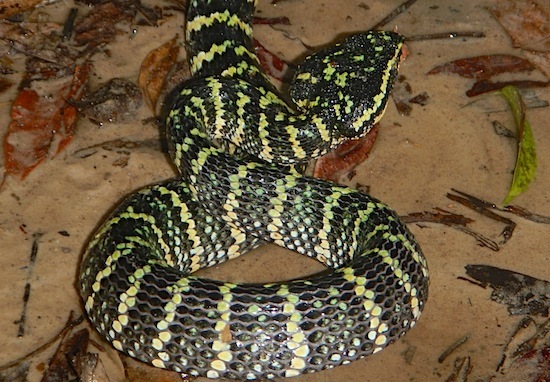 The multi-valent antivenom for green pit vipers treats envenomation by this snake. Offspring: Live birth in September is common, with up to 41 young per litter. Male and females look different from day one, the females having light banding and the males with creme / red or brown dots on the top of the body. Notes: Though these snakes are said to be exclusively arboreal and nocturnal, I found one on a mountain recently during the middle of the day, on the ground, during a rain shower. See the video below. Classified by Boie, in the year 1827. 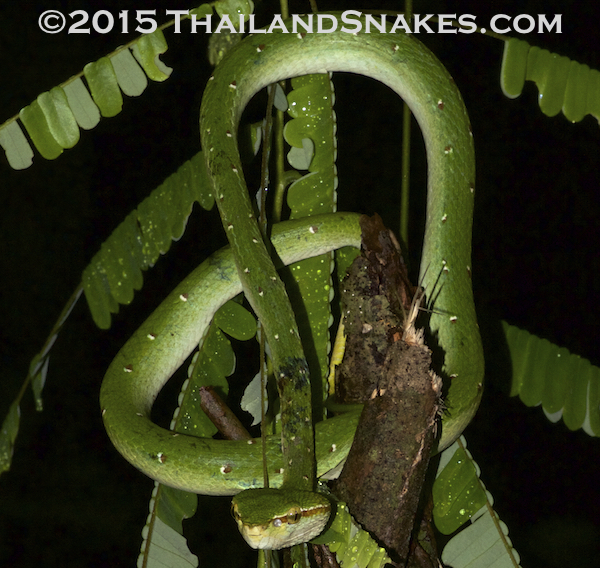 Video 1 – Wagler’s Pit Viper – found during daylight hours during a moderate rain shower with dark skies at around 400 meters elevation on a mountain in Krabi province, Southern Thailand. White Lipped Green Pit Viper in Thailand - I think. A reader, Jeremy Gatten, sent this photo (used with permission) of a green pit viper he found one night while looking for owls near Wat Tham Pha Plong near Chiang Dao in Thailand’s north. I was thinking it was. He had squatted down to rest and heard a little rustle in the brush – and found this amazing specimen of… well, pit viper. I don’t know which one it is – but, I’m guessing it’s the White Lipped Pit Viper. Jeremy himself narrowed it down to one of two – either Trimeresurus macrops or Trimeresurus albolabris (White Lipped Pit Viper). 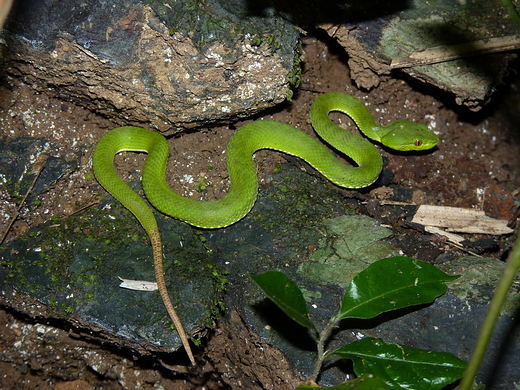 Note – do be very careful not to be bitten by any of the green pit vipers, their venom – while not usually deadly – is quite strong and can cause havoc in the human body. Vipers are typically identified (in general) by their small size (< 1 meter) and the triangle shaped head.